This cap reflects the console state immediately after a distant lightning strike. Here, the FFT display has just jumped up about 10dB from its normal position. What's pretty cool about this is the fact that because I do most of my DXing with a small resonant loop, the response of the loop is clearly seen as a crown in the noise floor. Likewise, the horizontal lines in the waterfall pane corresponding to strike noise brighten around the antenna resonant point. glad u posted that jFarley. thanks a lot. have been wondering lately whether i could use an sdr, specifically an sdr-iq. seems like for the money, a lot of folks have been satisfied with its capabilities. it looks like the radio has been out for several years now. i guess they must keep upgrading the software. S McArdie: There's several programs that support the RF Space SDRs (SDR-IQ, netSDR, etc), in addition to the SpectraVue app that comes with it from RF Space. 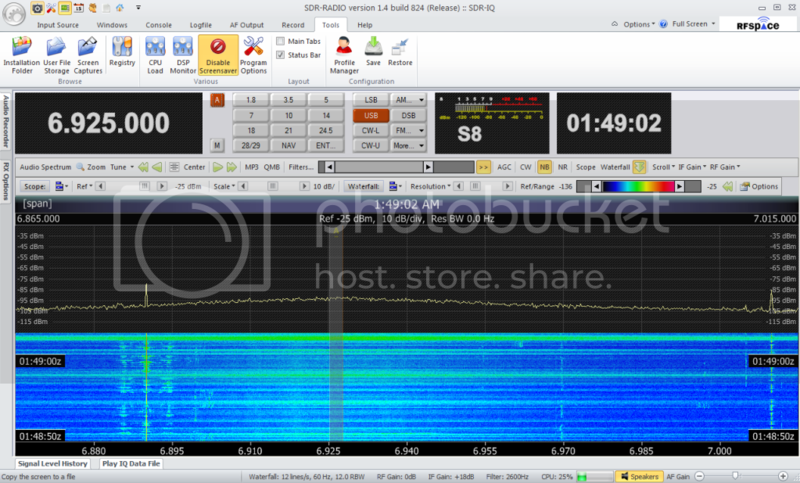 There's the SDR Radio package for Windows, and the SdrDx program for the Mac, both are free, and seem to get updated every few weeks. okay, much thanks for the info Chris. Maybe one of these days i'll ante up.